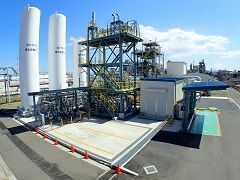 TOKYO, Apr, 16 2019 - (JCN Newswire) - Showa Denko Gas Products Co., Ltd. (SGP), a consolidated subsidiary of Showa Denko (SDK; TSE:4004), has established a new plant to produce liquefied carbon dioxide (CO2) in its Oita Plant located in the premise of SDK's Oita Petrochemical Complex, and started shipment of products. Liquefied carbon dioxide and dry ice (solidified CO2) are used in many fields including beverage, food, and other manufacturing industries. Liquefied carbon dioxide is made from CO2 gas contained in by-product gas generated in the processes of oil-refining, steel-making and ammonia production. However, the scaling back of oil-refining and ammonia production processes in Japan has been resulting in reduction in supply of by-product gas used to produce raw CO2 gas. Thus a tight supply-demand situation for liquefied carbon dioxide and dry ice is chronic. SGP had been producing liquefied carbon dioxide and dry ice at multiple production bases including Kawasaki Plant, which functions as the main base, and Yokkaichi Plant. Start-up of Oita Plant has given SGP an additional capacity to produce 15,000 tons of liquefied carbon dioxide per year. Under tight supply-demand situation concerning liquefied carbon dioxide and dry ice, SGP had been maintaining stable supply of CO2 products to customers throughout Japan by means of long distance transportation and the imports of dry ice. The start-up of Oita Plant enabled SGP to reinforce its system to supply CO2 products in a stable manner. As a result of the establishment of the new facility, SGP has become the 12th member company to form the community of SDK's Oita Petrochemical Complex. SGP's project to establish Oita Plant has been acknowledged by relevant organizations that it is eligible for the "Program to subsidize establishment of corporate bases in Oita City" sponsored by Oita City and the "Program to promote establishment of corporate bases that can lead growth of regional economies" sponsored by the Ministry of Economy, Trade and Industry (METI) under the provision of Regional Future Investment Promotion Act. The Showa Denko Group will maintain steady operation of the new facility and stable supply of safe products to customers in the region, and contribute to the growth of the regional economy.